We are often asked why we chose a woman for our logo. But in our opinion, it’s not about which of the genders someone has. It’s more about the Mental Model that we operate from. A Mental Model is similar to a computer Operating System. Most people have a preference for one or the other. People who use a Mac hate to work on a PC. And people who work on a PC… well they don’t want to work on a Mac. Isn’t it strange that 2 Operating Systems, which are supposed to do similar tasks, can arouse such powerful, visceral, reactions. And people strongly defend the one they prefer. They are just Operating Systems. It’s similar to how to look at differences between men and women… they are like 2 Operating Systems. So, it’s not about really which gender someone has. It’s more about which Mental Model we use, just like which computer Operating System. So, we call these Mental Models the Traditional Male Model and the Traditional Female Model because they are like 2 different Operating Systems. The other thing to realize about these Traditional Models is that many people have mixed patterns. It’s not just because someone is a man that they always use the Traditional Male Model or if they’re a woman they have the Traditional Female Model. Today you’ll see people who operate from either at different times. Sometimes it’s not an either or. Sometimes you’ll find people somewhere in the middle. There are many men who operate from the Traditional Female Model and many women who use the Traditional Male Model and everything in between. And it also varies by topic or by context. The way you are at home may be very different than how you are at work or when you’re on holiday. It may be different when you’re stressed out to when you’re feeling very laid back and calm. In the Traditional Male Model, life is like a team sport. Well, if that’s true, then you win some and you lose some. You can lose now, but you could always try again because there’s always going to be another game. The rules in a team sport are there to be outsmarted. In a football game, the players try to get away with things and hope the referee doesn’t see it. In baseball, you try to steal a base if you can get away with it. And deceiving the other team, faking them out, is highly valued. And in a team sport, everyone has a role. You need all the players to play the game. And they are expected to play their role. And in other words, life is a game. Nearly everything in life is a game. This is the Traditional Male Model. And from this come a lot of the differences between how men and women operate. Let’s look at the Traditional Female Model. Life is like a what? I was a bit shocked when I learned this and then I realized it fit. In the Traditional Female Model, life is like a traditional classroom. So, what is true in a traditional classroom and what are the rules? Well, the rules have to be followed. Cheating is punished. Failure is a complete disgrace, but hard work will be rewarded. If you work hard at school, you pass your exams and get promoted to the next grade. In a traditional classroom, it’s not just your work that’s being evaluated. You are evaluated as a person. It’s personal. So, if you’re doing poorly, you are a bad student. It’s all about who you are and the consequences are real (it’s not a game!). That’s the major difference between the Traditional Male Model and the Traditional Female Model. In the Traditional Female Model, it’s not a game. It’s real. And what you do and what happens has real consequences. If you fail an exam, YOU do not pass. The Female Model sees life as real. When people believe “it’s real, it’s not a game” they tend to avoid taking unnecessary risks, they want to make sure every little detail is right, since they are being evaluated as a person, and so, often they get stuck in perfectionism. 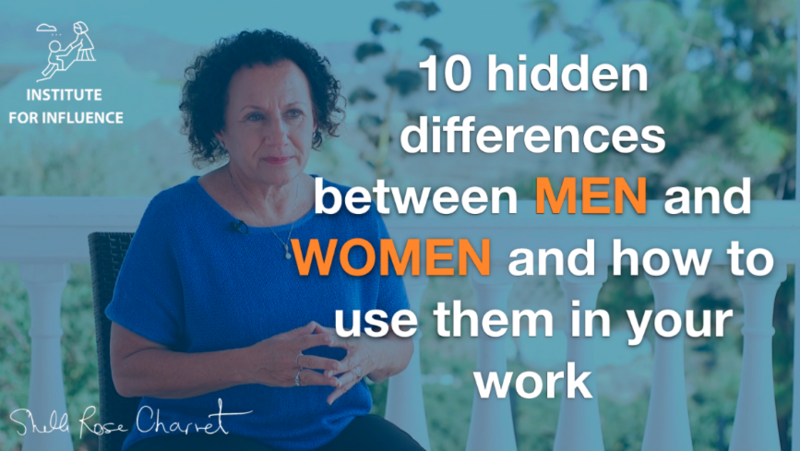 Taken to extremes, people operating from the Female Traditional Model can become quite inflexible at times and they are also likely to feel hurt very easily – and often! Look what happens when someone operating from the Female Model is criticized – they often take it badly (because “it’s real”). People who operate from the Female Model also are more likely to be manipulated and exploited. Why are they more vulnerable to this? they are conscientious about their work. The Female Model is about authenticity, caring for others and following the rules, doing the right thing – behaving ethically. And more importantly, when someone is operating from the Female Model, they tend to be on a mission. It’s not just a game for them, just to beat the competition. It’s much more. It’s a mission. It’s a passion. Some of the major accomplishments that we admire nowadays came from people operating from the Female Model. Take Steve Jobs for instance. Yes, he was aggressive with his employees. He took everything in product design and business very personally and was known for blowing up over small design elements that other people might say are unimportant. He is on a mission to go to Mars. He wants to save humanity, and it’s not a game for him. He was willing to lose all his fortune for his mission. Look at Oprah. She became so successful as an interviewer because she created authentic relationships with everyone she interviewed. She cared about them as people, not just as interview subjects to amuse the audience. Even the audience was real to her, not just spectators to a sport. The woman in our logo represents The Female Model in a Leadership role. Both men and women can operate from this model. As we have seen, people operating from the Female Model are more vulnerable. And also, they have something important to bring to this world. They deserve to be in Leadership positions. Our purpose, at The Institute for Influence, is to help them achieve their mission. To help them be more influential. To help them think more strategically. To help them impact millions of people. Do you have something important to accomplish in your work? We want to help you get there! Want to learn more about the Traditional Male and Female Models? Note: This information is adapted from the research done by Suzette Haden Elgin, Margaret Hennig, Anne Jardim and others. They studied men and women, and not the Mental Models as such. Shelle Rose Charvet is the first author who taught the Male and Female Traditional Models as Operating Systems for both men and women and not as gender specific.